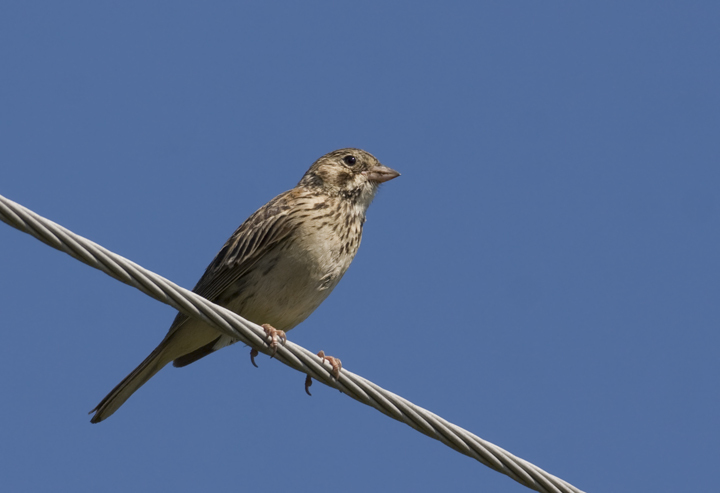 Bugs and breeding birds in Western Maryland with Jim Stasz, Jim Brighton, Mike Burchett, Steve Collins, Tom Feild, Hans Holbrook, John Hubbell, and Mikey Lutmerding. Last updated: 6/16/2008. 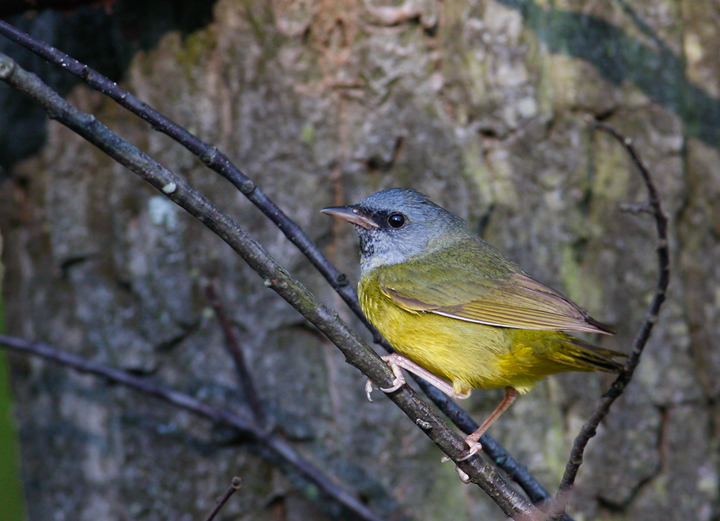 Above: A nesting Mourning Warbler in a remote part of Garrett Co., Maryland (6/15/2008). 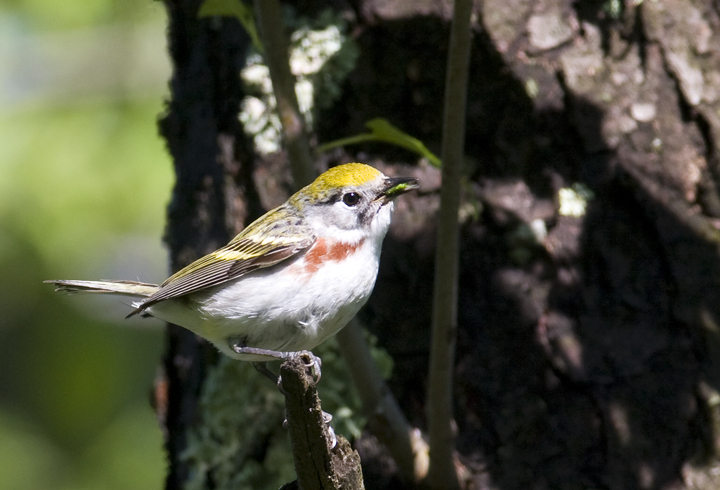 Below: A Chestnut-sided Warbler in Garrett Co., Maryland (6/15/2008). 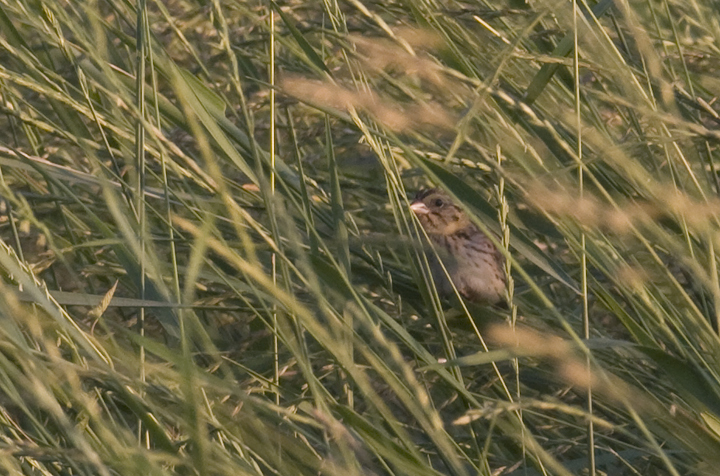 Above and below: Distant documentation photos of a Henslow's Sparrow in Montgomery Co., Maryland (6/15/2008). 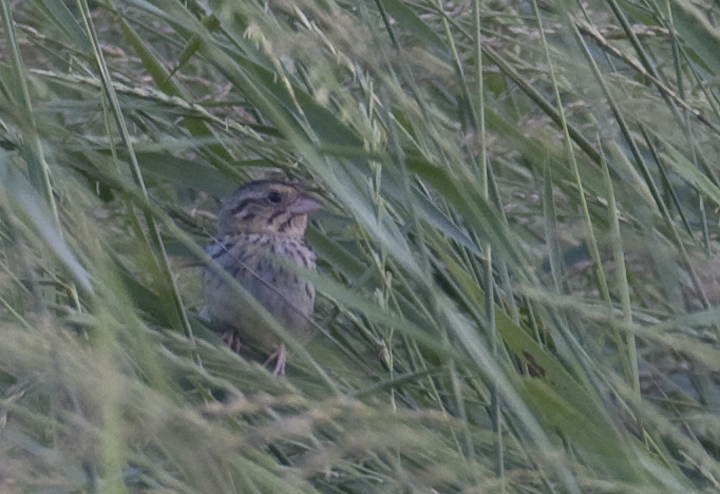 This is a very rare, out-of-range sighting. 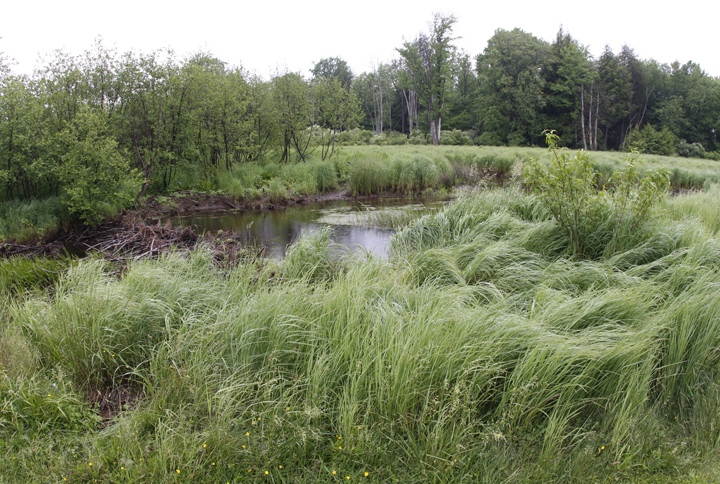 Big kudos to Jim Green for finding it and getting the word out. 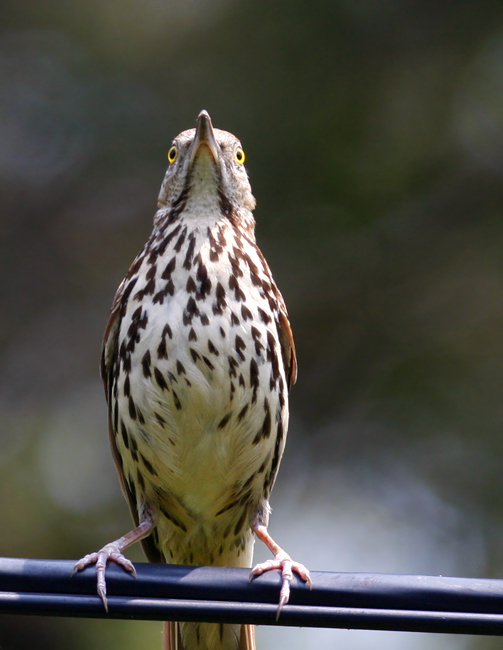 Also, thanks to John Newman and members of the NIH staff for taking steps to ensure the habitat is left intact as this bird attempts to attract a mate. 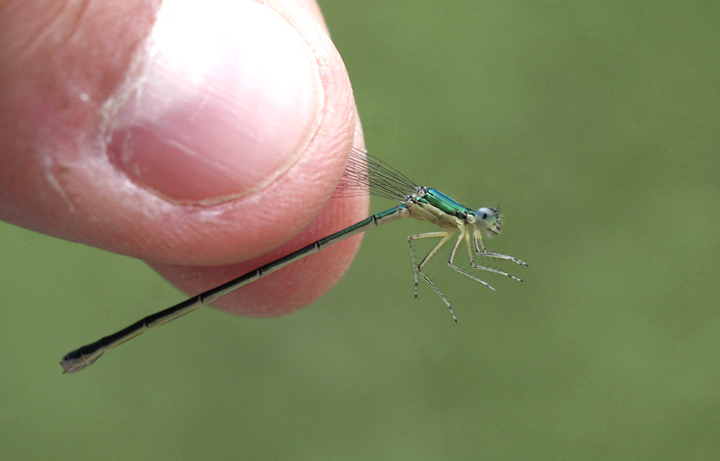 Below three: A beautiful and state-rare damselfly, the Superb Jewelwing, in Garrett Co., Maryland (6/15/2008). 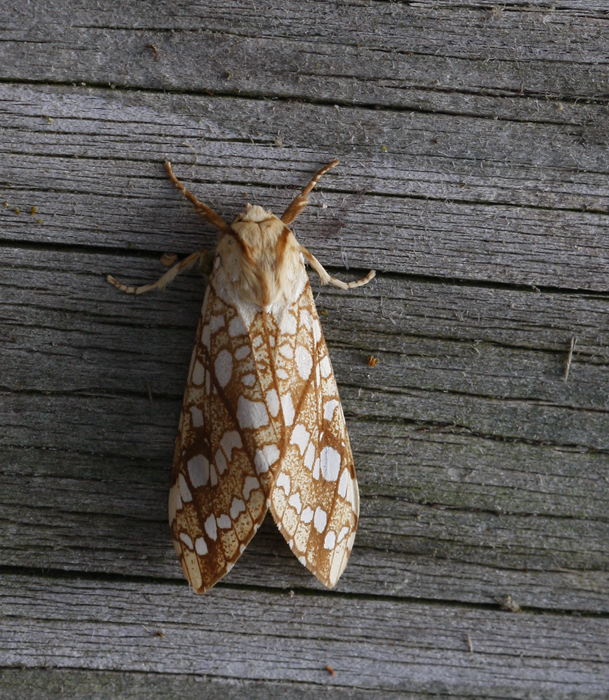 Below: A Hickory Tussock Moth in eastern West Virginia (6/13/2008). 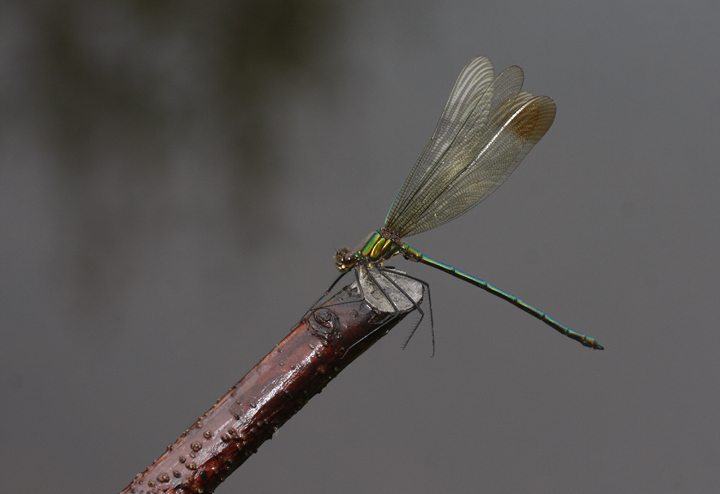 ID courtesy of Jim Brighton. 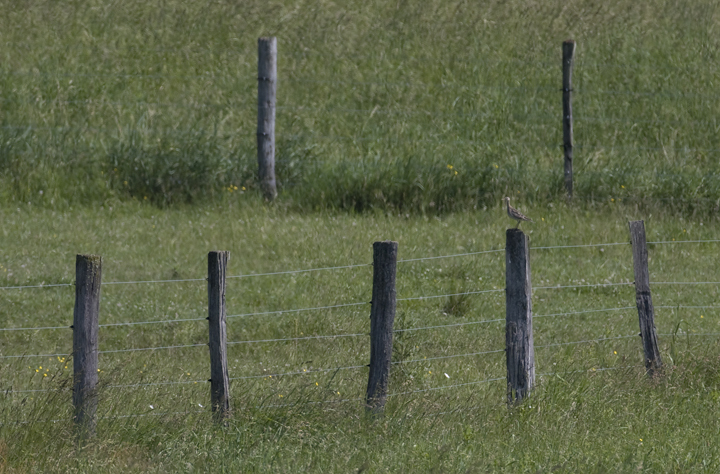 Below: A sight that we all wish were much more common--a nesting Upland Sandpiper keeping watch on his meadow domain from a fence post (Garrett Co., Maryland, 6/15/2008). 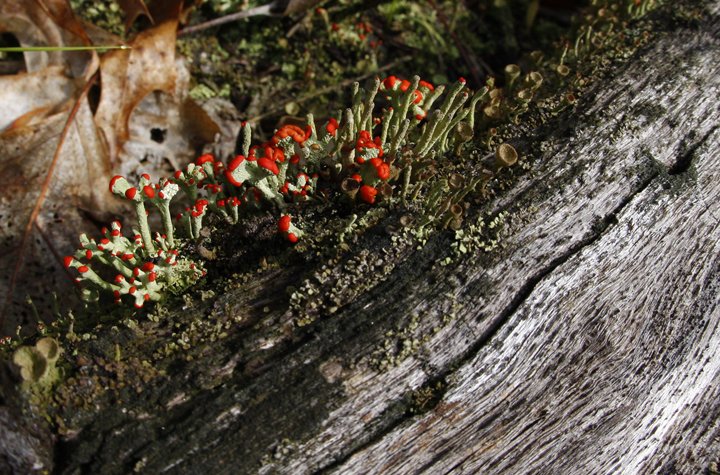 Below: My favorite lichen, British Soldiers (Cladonia cristatella), in Garrett State Forest, Maryland (6/14/2008). I love that lichens have a single scientific name despite being composed of at least two species, a fungus and an alga or bacterium. 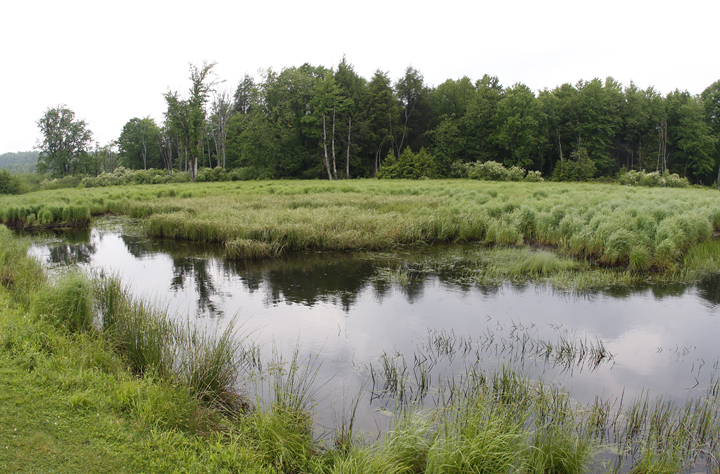 Below: Habitat in Garrett State Forest, Maryland (6/2008). 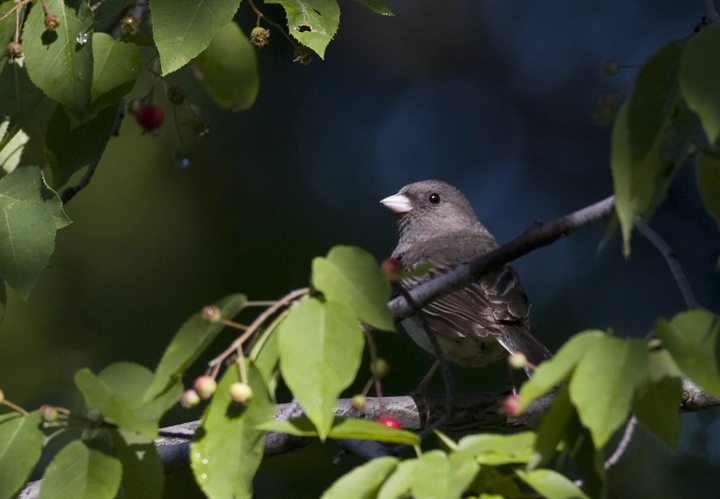 Below: A nesting Dark-eyed Junco in southwestern Garrett Co., Maryland (6/15/2008). 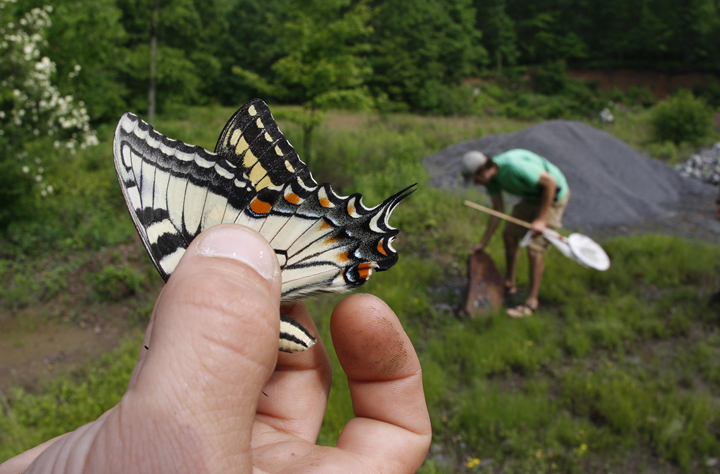 Below: An Appalachian Tiger Swallowtail is carefully studied while Mikey Lutmerding continues the search. 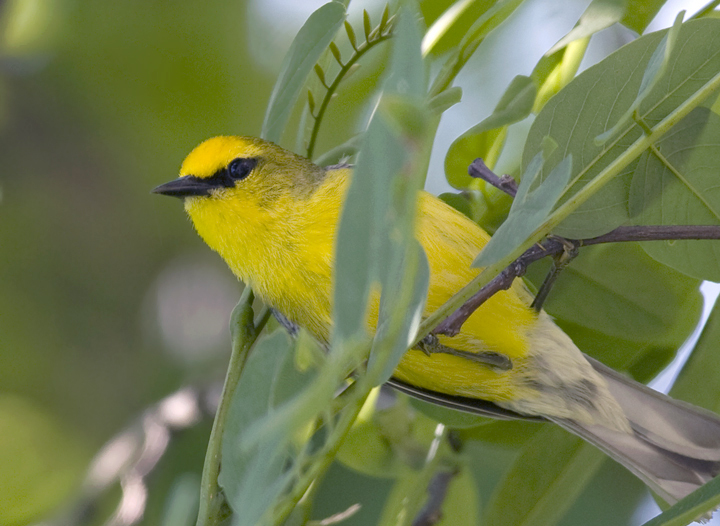 Below: An unusual sight in Garrett Co., a Blue-winged Warbler. 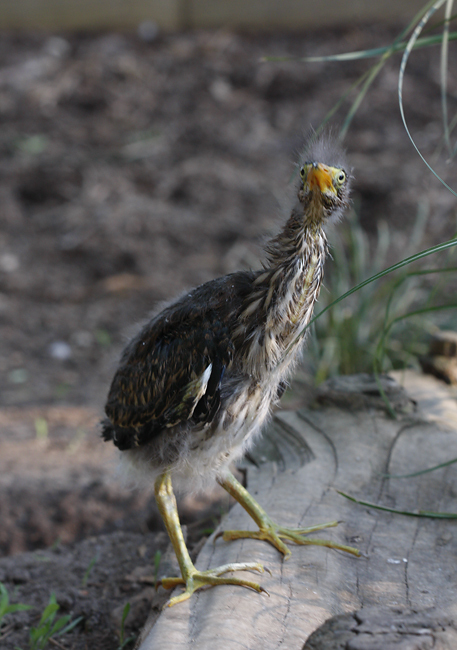 This bird was on territory near Jennings Randolph Lake (6/15/2008). 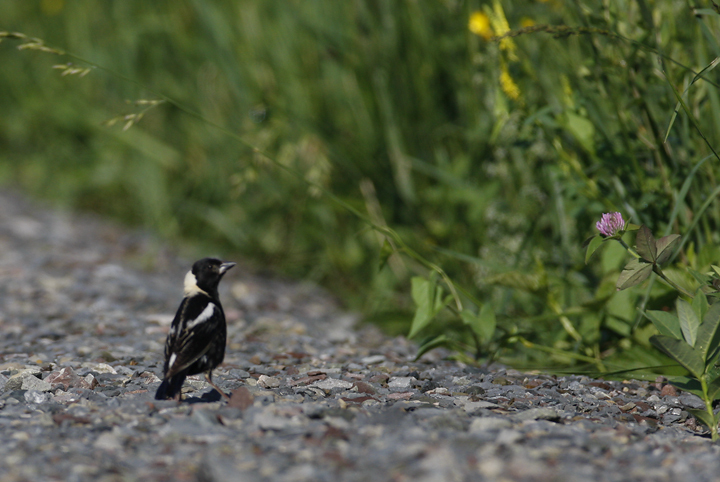 Below: A male Bobolink forages on the roadside in southwestern Garrett Co., Maryland (6/15/2008). 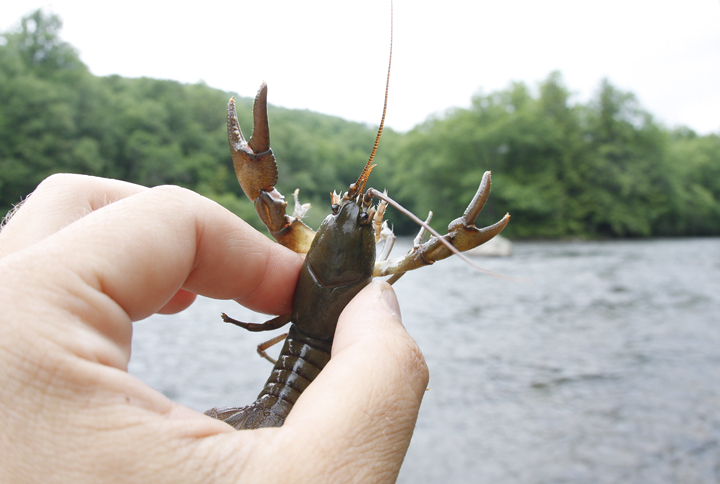 Below: Having Mikey Lutmerding with us meant we had a crayfish expert handy. 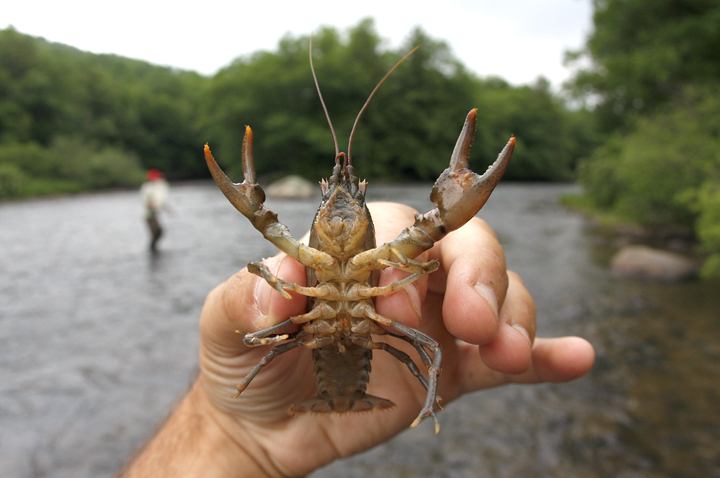 The first two images show an Appalachian Brook Crayfish (Cambarus carinorostris) and the third image shows an Upland Burrowing Crayfish (Cambarus dubius). 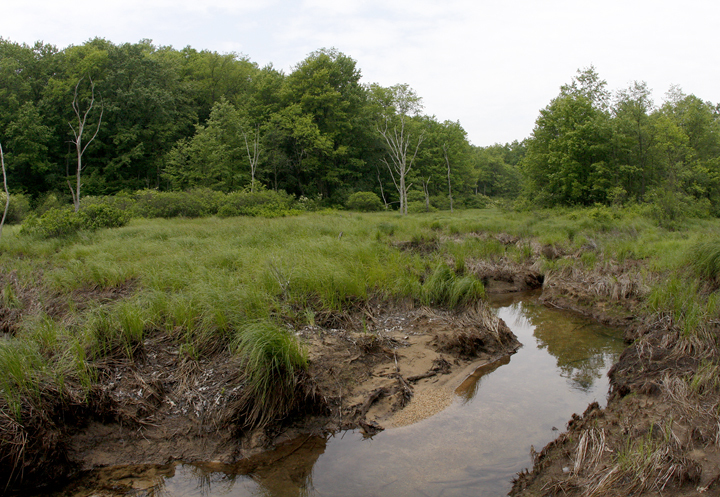 Below: More beautiful habitat in western Garrett County. 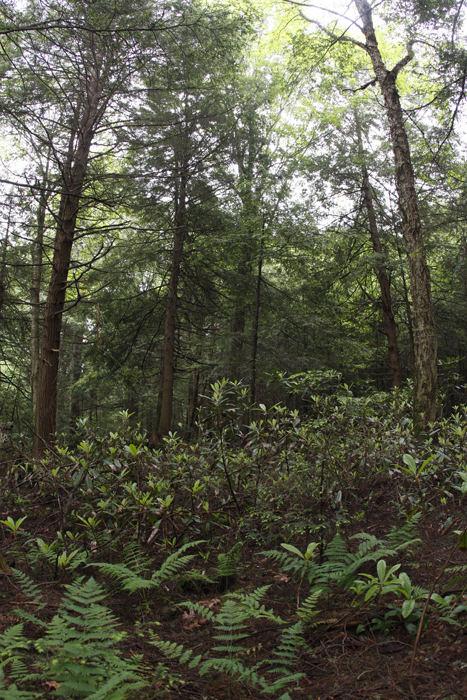 This area, composed in large part of Eastern Hemlock, Rhododendron and ferns, hosted nesting Golden-crowned Kinglet, Blue-headed Vireo, and Black-throated Green and Black-throated Blue Warblers (6/14/2008). 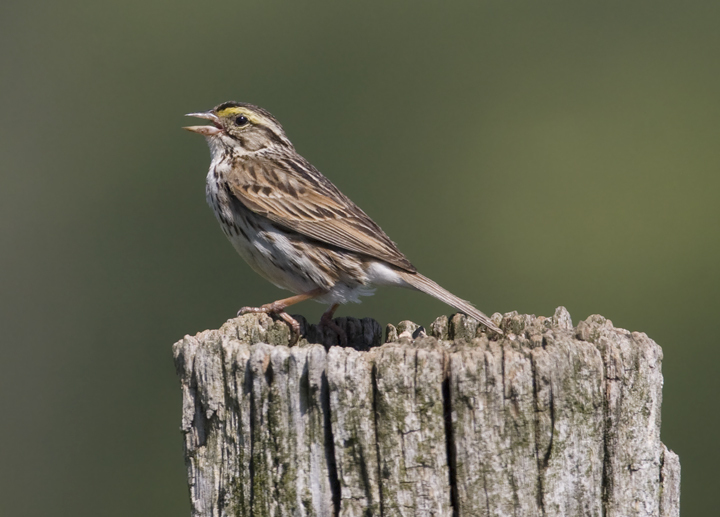 Below: A nesting Savannah Sparrow sings from a fence post in eastern Garrett Co., Maryland (6/15/2008). 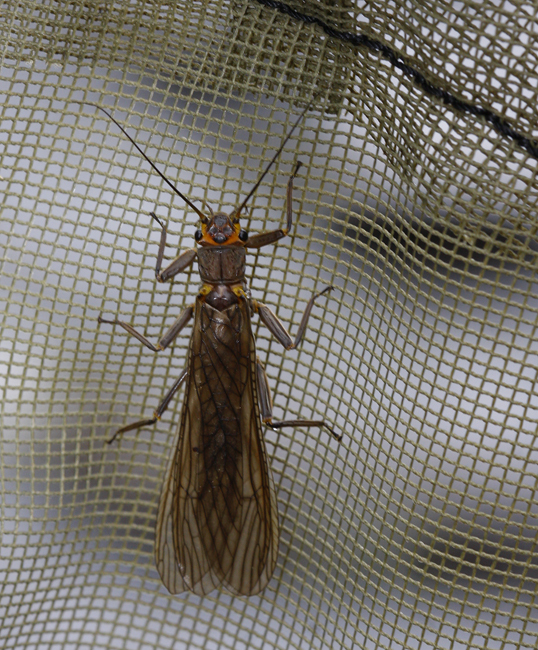 Below: A stonefly netted in western Garrett Co., Maryland (6/15/2008). What is this one again, Mikey? 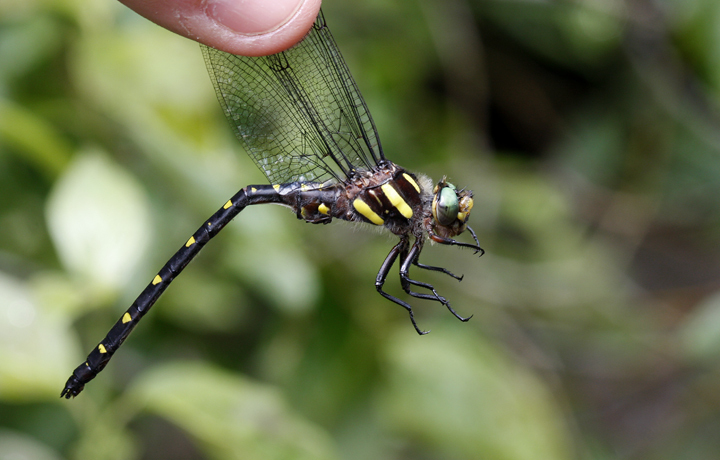 Below: A Twin-spotted Spiketail in western Garrett Co., Maryland (6/14/2008). 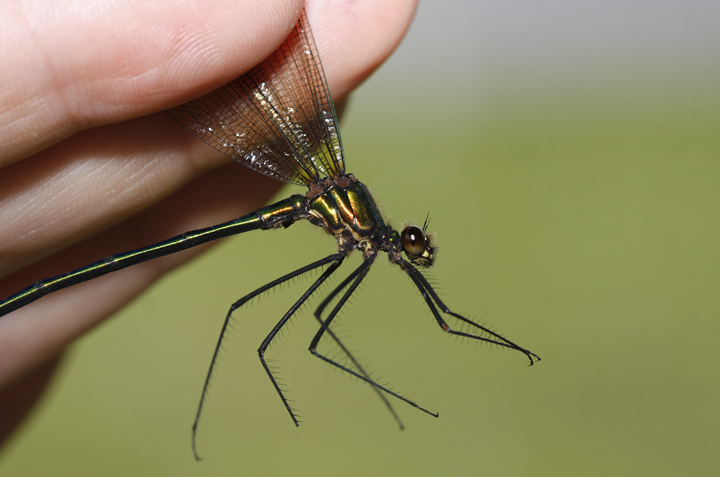 Below: The tiny Sedge Sprite in Garrett State Forest, Maryland (6/14/2008). 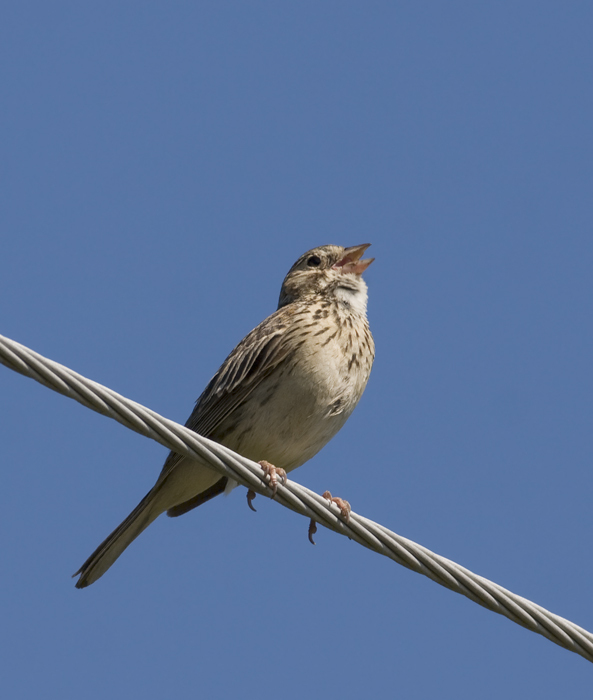 Below: A particularly confiding Vesper Sparrow sings heartily in eastern Garrett Co., Maryland (6/15/2008). 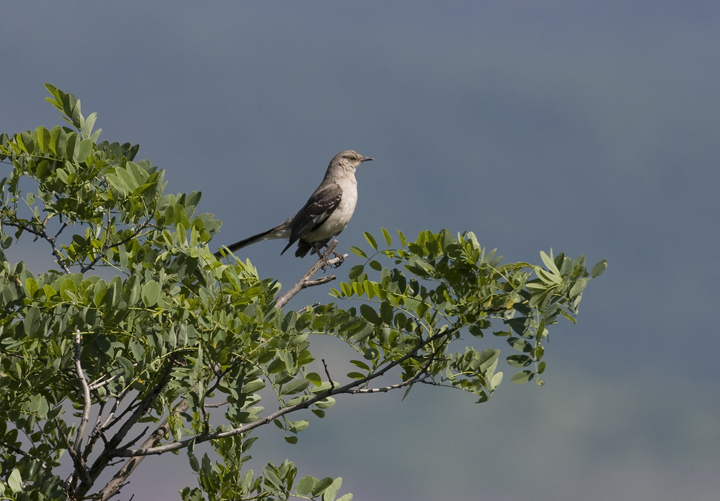 Below: Interestingly, Northern Mockingbirds are very scarce in Garrett County (6/15/2008). 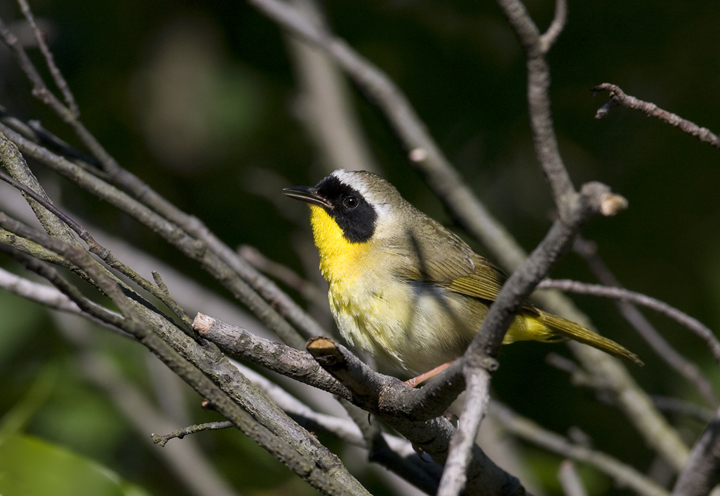 Below: A male Common Yellowthroat in Garrett Co., Maryland (6/15/2008). 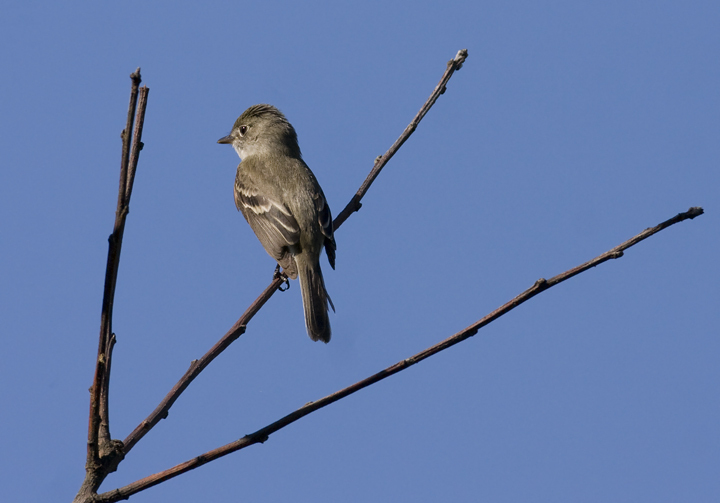 Below two: While common breeders in Garrett Co., Least Flycatchers are scarce in Allegany Co. during breeding season. 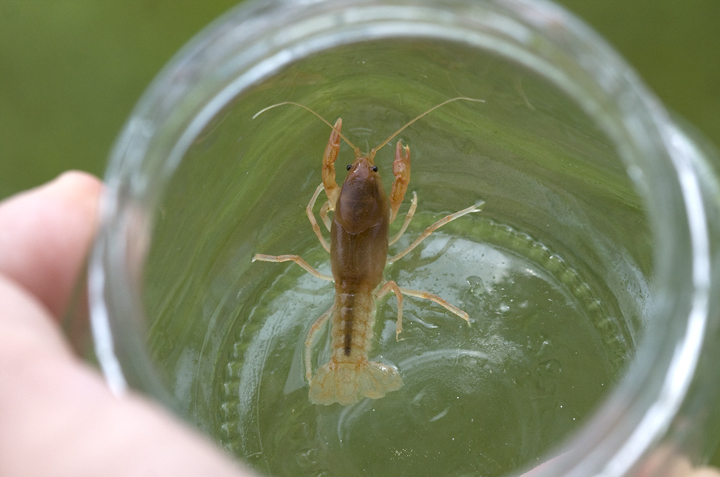 This seemingly territorial individual was found by J.B. Churchill (6/15/2008). 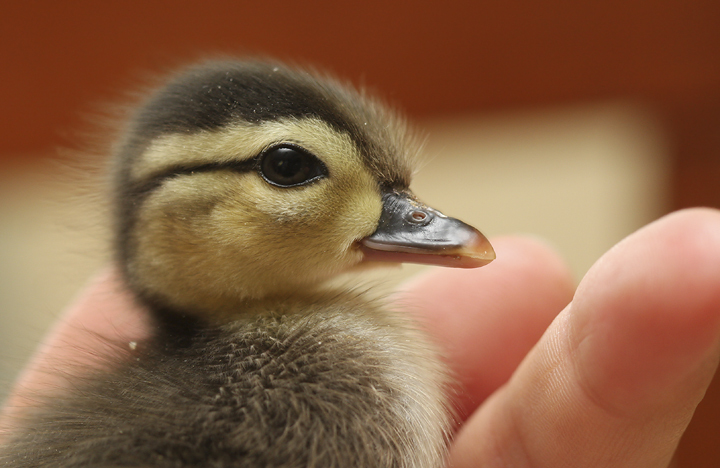 This angle is actually ideal for studying the bird's primary projection. 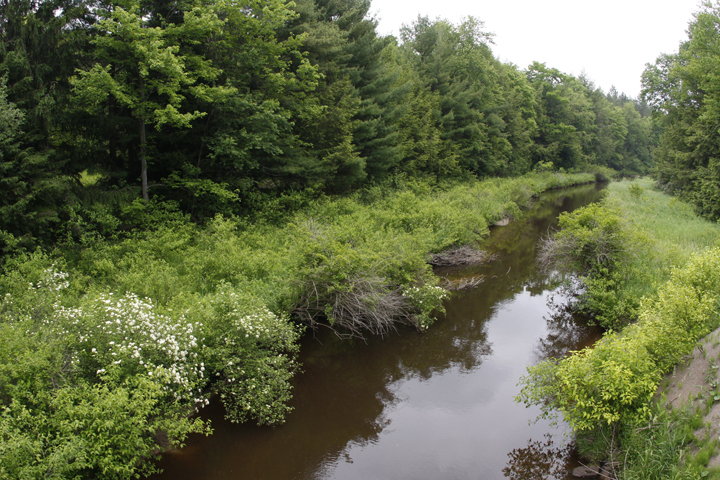 Below: Muddy Creek in western Garrett Co., Maryland (6/14/2008). 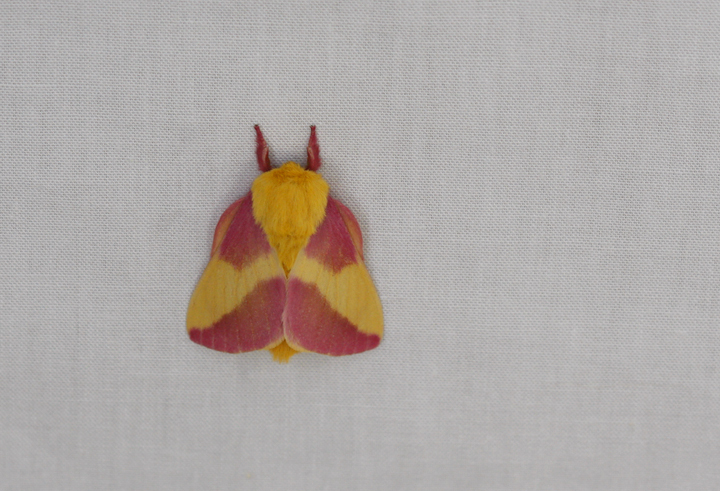 Below: The hard-to-believe Rosy Maple Moth - West Virginia, 6/13/2008. 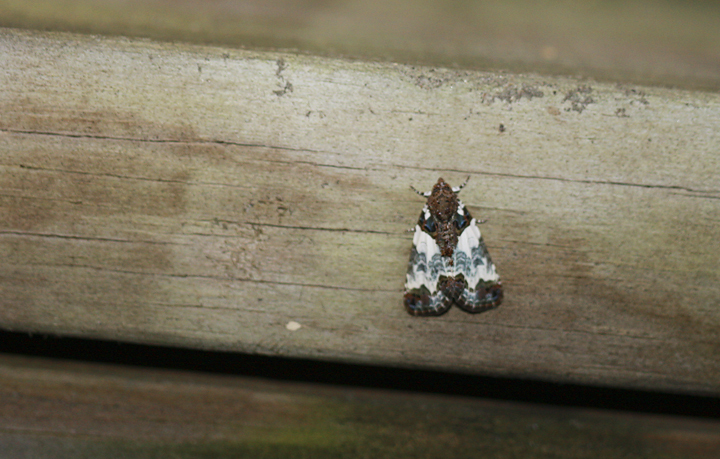 Below: A Tufted Bird Dropping Moth (Cerma cerintha) at Alpine Lake, West Virginia (6/13/2008). 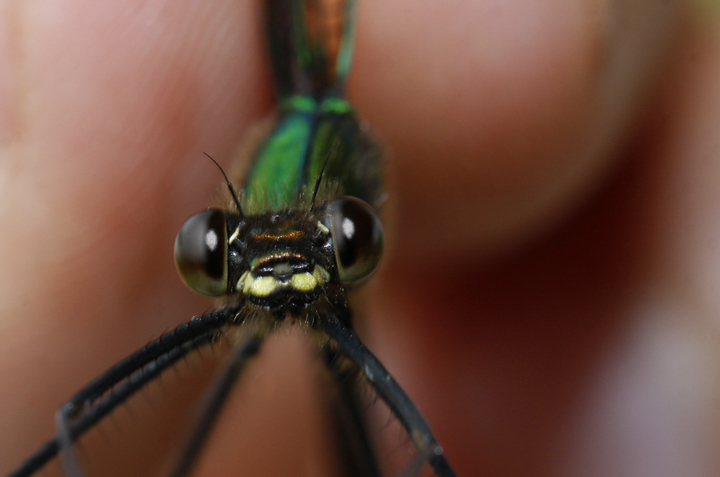 ID courtesy of Jim Brighton. 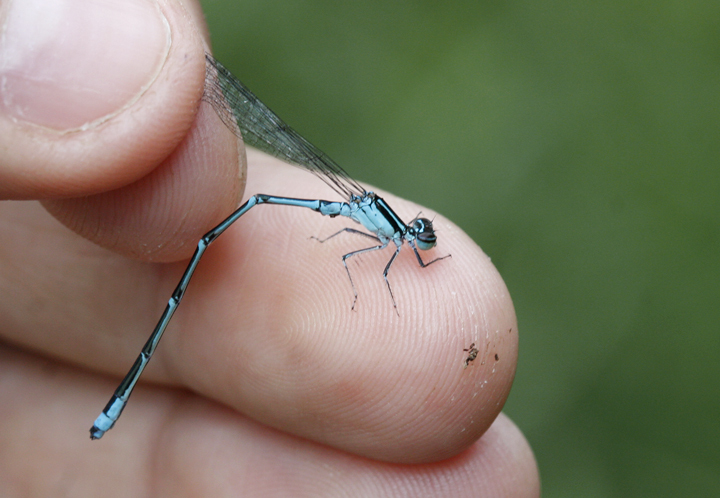 Below: A Stream Bluet found along the Youghiogheny River in Garrett Co., Maryland (6/14/2008). 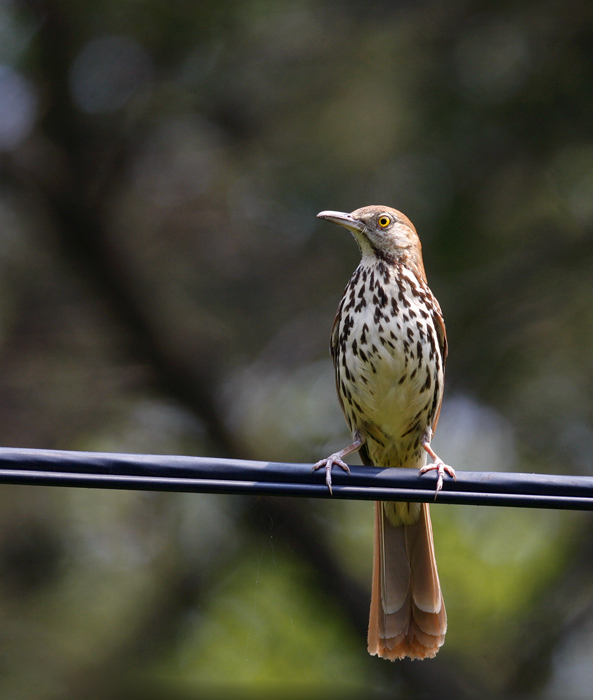 Below two: A Brown Thrasher at the Patuxent Research Refuge in Anne Arundel Co., Maryland (6/13/2008). 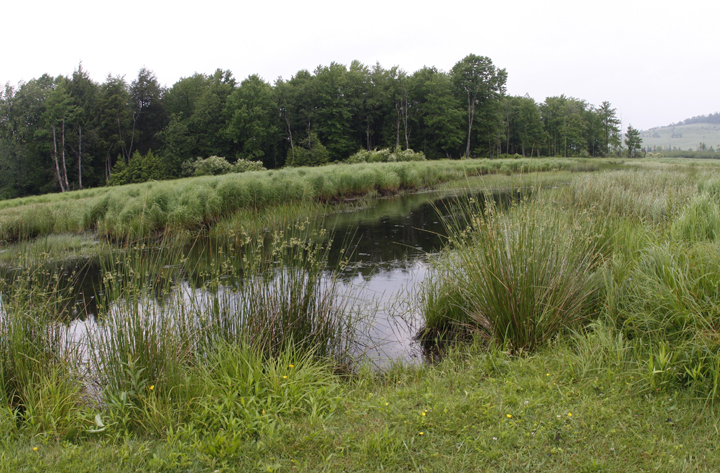 Below three: More photos of habitat in Garrett Co., Maryland (6/14/2008). 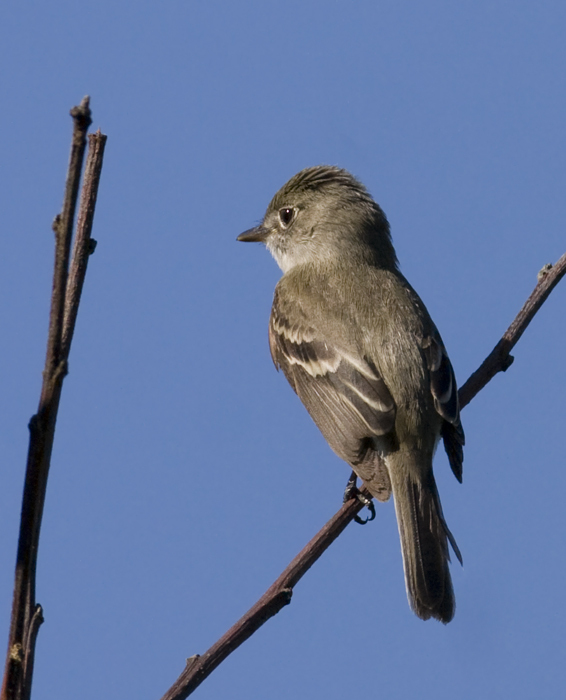 Bird species found here include Alder Flycatcher and Northern Waterthrush. 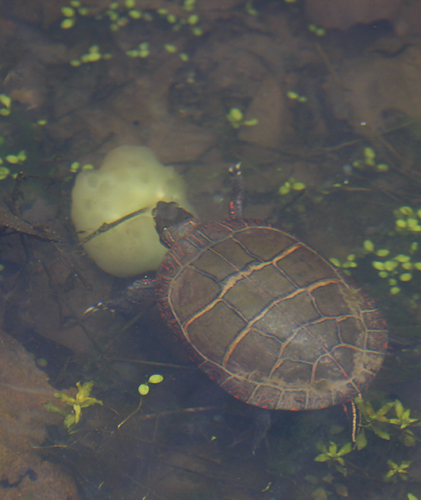 Below two: The Painted Turtles in Garrett Co. are of the Midland subspecies (Chrysemys picta marginata). 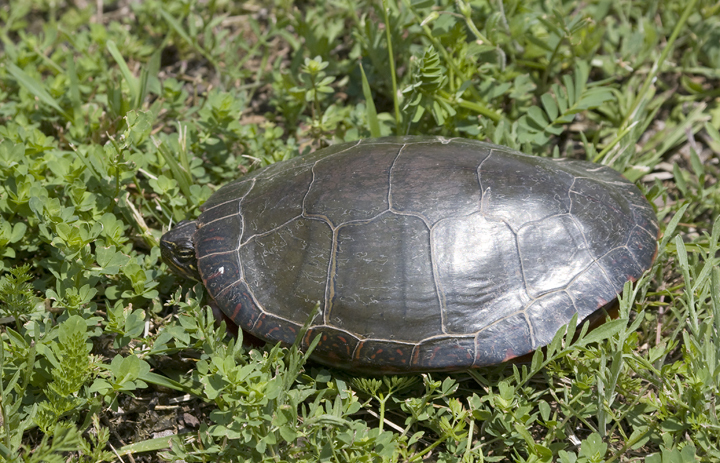 Unlike Maryland's more widespread Eastern Painted (C. p. picta), the scutes on the carapace (plates on the upper shell) are staggered rather than even with one another across its shell. 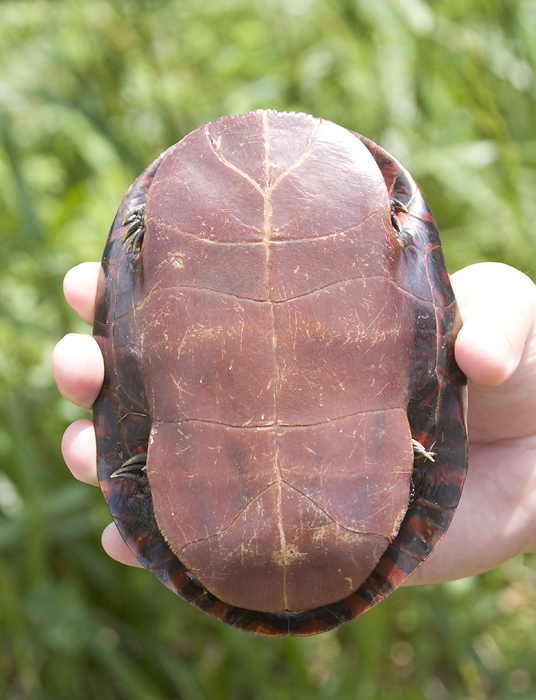 The plastron (underside) is variable, often showing dark splotches but sometimes all dark as in this individual. 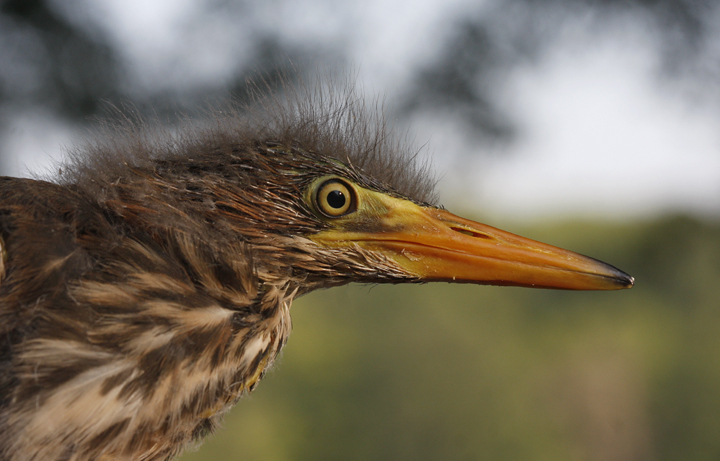 Below: Compare the scute pattern on this Eastern subspecies individual photographed along the C&O Canal (4/2008). 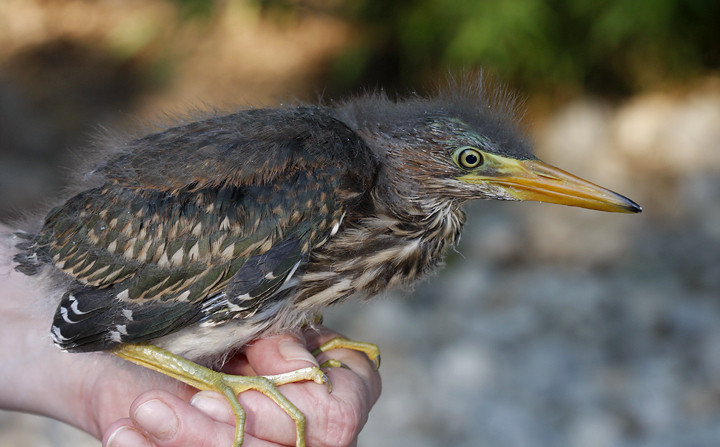 Below: Baby birds being rehabilitated by my neighbor, Terry Moritz--a Wood Duck and a Green Heron. 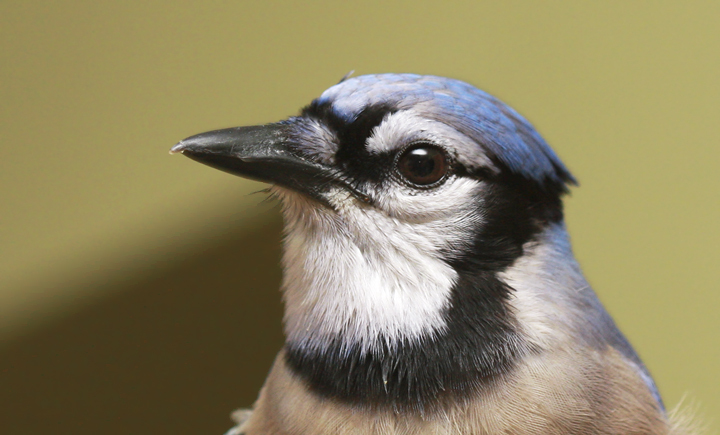 Below: And here is one that decided not to leave, a Blue Jay that prowls the neighborhood imitating Terry's phone and wolf-whistling at you. Interestingly, it does the latter only if someone is getting into or out of a car.